Are you team chocolate or team peanut butter? Just like coffee and cream, pancakes and maple syrup, or spaghetti and meatballs — peanut butter and chocolate just go together in a wonderful way. 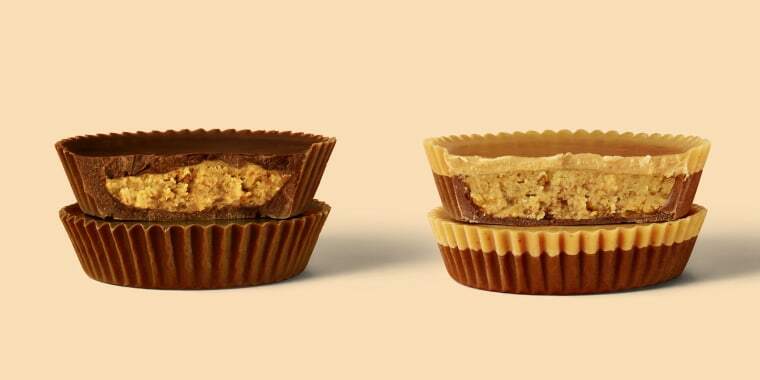 Now Reese’s wants fans of its popular peanut butter cups to pick a side with two new offerings. Its limited-edition cups will pit chocolate fans against peanut butter lovers. “Reese’s is giving you the chance to have more of what you love with the new limited-time Reese’s Lovers Cups,” the Hershey’s company told TODAY Food in a statement. The two new cups — “Chocolate Lovers” and “Peanut Butter Lovers” — will be available nationwide beginning in mid-April. The Lovers Cups give candy fans choice between enjoying more peanut butter or more chocolate. “The new Reese’s Peanut Butter Lovers will literally have a peanut butter candy top shell, and the new Reese’s Chocolate Lovers is more chocolate than we’ve ever packed into a Reese’s Cup,” according to Hershey's. The Chocolate Lovers cup has a much higher proportion of richer milk chocolate and a thicker shell surrounding the peanut butter. The Peanut Butter Lovers, which looks truly unique, contains more peanut butter inside, a thinner chocolate shell and is topped with a peanut buttery coating. The Lovers cups come in both regular and king-size sleeves. Each serving has only one kind of the new cups so if you want to try both, you'll have to buy two packs or find a friend and swap one out. To launch the new Lovers Cups, Reese’s will open a “Reese’s Swap Shop” in New York City from March 26 to March 27. Reese’s fans can swap any beloved item (old skates, a toaster, even a stuffed animal) for a Reese’s Chocolate Lovers or Peanut Butter Lovers cup. The modified combinations beg the age-old question: is too much of a good thing a bad thing? After all, the classic Reese’s already has the ratio of peanut butter to chocolate down to a delicious science. Reese’s has produced at least one unplanned product, too. Last July, a man in Iowa, bit into a peanut-butter-less peanut butter cup. He posted a Facebook video of the treat to prove it wasn't Photoshopped fake. To apologize, Reese's sent him a giant care package filled with all types of Reese's cups. For Reese’s fans who prefer not to mess with perfection, the limited-time cups won’t be replacing regular old Reese’s so there's no need to stockpile them.